Emilie de Ravin has played a wide range of characters in her 15+ year career. From Tess Harding on the cult WB classic Roswell to fan favorite Claire Littleton on Lost and the equally-popular Belle on ABC’s Once Upon a Time, de Ravin’s characters are as beloved as they are diverse. One thing that ties all of her characters together though is passion, which de Ravin has in spades in real life. We caught up with her to talk about her most recent project, The Submarine Kid. Co-Written by Finn Whittrock (who also stars) and Eric Bilitch (who directs), it tells the story of Spencer who returns after years away at war and has a tough time adjusting to life back home. That’s when de Ravin’s Alice walks into his life, and nothing is ever the same. Taking time in between the holidays and getting ready to head back to set to film the second half of OUAT Season 5, de Ravin spoke with us about The Submarine Kid, what’s next on OUAT and if she’d ever work on the other side of the camera. HelloGiggles: What can you tell us about the movie, The Submarine Kid? 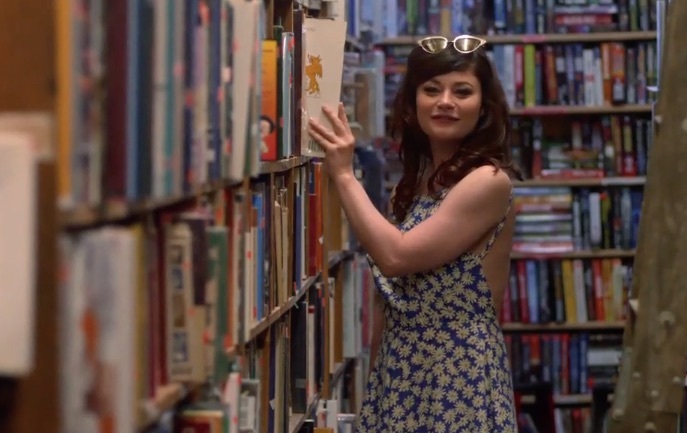 Emilie de Ravin: I loved the story from the moment I finished reading it. It really just hit home on a lot of points. It’s a really entertaining story, and a really wonderful message set in a world [with a] little bit of fantasy, but some would say the real world. It’s a mixture of love and friendship and the effects of war on young people and really dealing with that in a very smart way [with issues not] being pushed aside. I’ve gotten such wonderful feedback and it really makes me happy. It really hits home with a lot of people on an emotional front. HG: Alice seems like a brand new character for you, one that you’ve never played before. EdR: She is… in an ideal world, I try and make it so, [with] each job I do, it’s not a repeat of a similar character…wearing different clothes and different hair. She’s a really unique character. There’s a lot of mystery surrounding her, and there should be. There’s a lot of questions that I have, that I hope the audience has. [I want there to be] some question about her, as opposed to her being a very cut and dry, “Oh that’s who she is, that’s what her motivation is, and that’s how she gets it.” It’s not about that. Her arc is fantastic. Her and Spencer’s relationship, it’s a really special one and [essentially] they help each other. She helps him move on with his life, and on the flipside of that, he helps her move on with her [spoiler!]. HG: Did you feel that you related to her in any way? EdR: No matter what, there’s always a little bit of [me] in everyone to a degree. And you know, [with] acting, it’s how much do you hide away from the camera or how much do you bring it to life? With Alice, she was kind of my middle ground. There were a lot of little pieces which kind of became their own thing, so that was the fun part of that. It wasn’t like, “Oh, I’ll use that part of me.” It just evolved really naturally. HG: What was it like working with Finn Whittrock? I only know him from American Horror Story, and in the movie that’s not the character he plays. EdR: [laughs] Finn is great. He loves the movie. [I’m] so, so impressed with him. He’s very talented…he was just trying to do something really, really different. And this [story] is very close to his heart… on an emotional level. There’s definately a lot of passion involved in this project. HG: Have you ever thought about writing, directing, or stepping behind the camera at any point? EdR: I don’t know. Maybe. It’s not something I’m working on right now. I don’t know, there are so many aspects of this job… and I definitely could not be a first [assistant director], let me put that out there! [Laughs] That is one of the hardest, and [most] underrated jobs! Literally, you’re holding the project together. I have a lot of respect for every job on the crew. You know, maybe [I’d move behind the camera]. Not right now, but maybe. HG: And I do have to ask, because I’m a huge OUAT fan, and a lot of HG readers are, too: Is there anything you can tease about the second half of Season 5? HG: It’s OK if you can’t! [The Underworld is] really cool. Being in the Underworld is a whole new thing, which is pretty darn cool. It’s kinda like having everyone in Camelot, [but] now everyone is in a black and white world. It brings out a lot of traits in people you didn’t know necessarily [know]. People deal with a lot of fear, which is a big thing in the second half. People dealing with their fears, people coming to [revelations], people moving on, moving forward — or are they stuck? That’s really a big thing. And it’s visually really cool! HG: Is there any potential RumBelle baby on the way? It feels like that’s been teased for SEASONS. I feel like things are going good… are things going good? It seems to change every episode. EdR: It does, which I love, come on. Any interesting relationship you [want to] watch. [Belle and Mr. Gold] have a lot of hills and valleys in their relationship, which is truly cool and really fun to play with… because the stakes are so high. And yeah, I think they might be on the right track for that… possibly. HG: Do you think Belle will ever find that true happiness? EdR: Belle’s not looking for happiness! Belle has found inner happiness with herself. She’s not looking. She’s never been someone to look for someone else to fulfill a part of her. She wants that stable partner with somebody…that mirror effect with somebody else. The only [reason] she’s able to continue [her relationship with Mr. Gold] at all is because she’s not looking for someone to make her confident, or make her happy, or make her rich. She’s not looking for something to be fulfilled. She’s looking for a partnership that she can share that with someone. HG: If you weren’t playing Belle, what other Disney character would you like to portray? EdR: On this show, it would have to be Rumple. I love his character. It’s interesting. Everyone has that side. Everyone has something in them that’s dark that’s, you know, inherently not what you want to be, and people don’t want to admit it. People just try and find that balance in life. The Submarine Kid is now available on VOD, along with Apple and Amazon, and you can check out the trailer here!